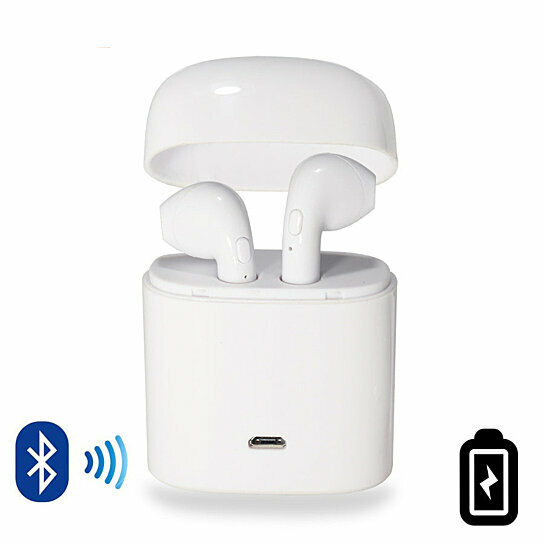 Dual Chamber Wireless Bluetooth Earphones With Charging Box with error correction built in gives you crisp clear sound every time. The earphones are compatible with Apple or Android phone with Bluetooth capability...They also work with your tablet, laptop or computer as long as Bluetooth is enabled. Get a quick connectivity with Bluetooth 4.1 and charging box that is simple and fits in your pocket. They come in White or Black Colors, charging box and cable to USB port for charging is included. The headphones come in multiple colors. A full charge will allow you to use the headphone all day with normal use or 4 hours of continues use. Recahrge earbuds all week with single full cahrge on the charger box.